Greensboro, NC (October 24, 2018) - Katharine Girone of Varna, IL, is the grand prizewinner of the 2018 Thrive #RootedinAg contest from Syngenta. This contest challenges growers and other ag industry professionals across the country to describe the person who most nourished their agricultural roots. 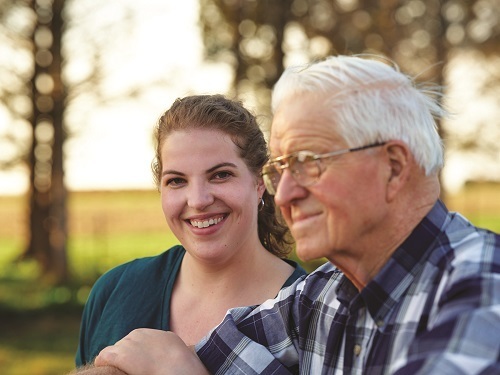 Girone, who works as a program coordinator for 4-H youth development at the University of Illinois Extension in Pekin, IL, and helps her family operate a fifth-generation farm, chose to honor her grandfather Kenneth McKee. Girone’s story resonated with both online voters and a panel of judges. Now, after receiving a mini touch-screen tablet alongside the four other deserving finalists, Girone has also won a $500 gift card. Additionally, Syngenta will make a $1,000 donation in her name to the Tazewell County 4-H program. Girone chose this group for the pivotal role it has played in shaping her relationship with her grandfather. 2018 marks the fifth consecutive year Syngenta has sponsored an essay contest for its Thrive readers. With her win, Girone joins an impressive group of #RootedinAg winners. In 2019, the contest will continue, and readers will be invited to tell their own stories of how they are #RootedinAg. To learn more about the contest or to read other ag news stories, go to www.SyngentaThrive.com. Join the conversation online by connecting with us at www.syngenta-us.com/social.